This Nulla Nomen slipper is made from 100% ecologically tanned leather. A stylish and timeless design that you can combine with any summer outfit. Handmade with love in Greece. 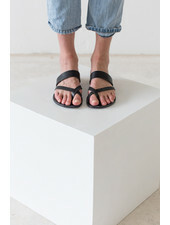 This Nulla Nomen sandal is made from 100% ecologically tanned leather. A stylish and timeless design that you can combine with any summer outfit. Handmade with love in Greece.